Eastmarch is a hold in eastern Skyrim, with its capital in Windhelm. The hold is the home of Jarl Ulfric Stormcloak, leader of the Stormcloaks movement. It only becomes Imperial-run if the player joins the Imperial Legion and completes the entire quest line, including both the Battle for Fort Amol and the Battle for Windhelm. Should this occur, the new Jarl will be Brunwulf Free-Winter. Eastmarch is in the northeastern corner of Skyrim. Winterhold is to the northwest, the Pale and Whiterun Hold to the west, the Throat of the World to the southwest, and the Rift to the south. The Dunmer homeland of Morrowind is to the east, across the Velothi Mountain passes. Since the Red Year, Dunmer have had a much bigger presence in Eastmarch, particularly in the capital, due to its proximity to one of the only passes through the Velothi. Eastmarch varies greatly. 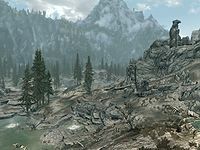 The central and southern parts of Eastmarch are dominated by sulfurous pools and rocky crags, as well as Bonestrewn Crest. The Velothi Mountains form a spine along the eastern edge of the hold, and a high ridge to the south leads up from the lowland sulfur pools to the Rift. The Darkwater River joins the White River in the west, after which the White River merges with River Yorgrim at the Windhelm bridge and flows out into the Sea of Ghosts. The sulfur pools are home to giants, deer, sabre cats, and other, smaller creatures, such as rabbits and goats. Further north are snowy sabre cats, ice wolves, and frost trolls along the road to Morrowind. There are a few farms near Windhelm, but otherwise the only plant in the snowy parts of Eastmarch is the humble snowberry bush. In the sulfur region to the south, in the middle of the hold, the endemic plants of dragon's tongue, Jazbay grapes, and creep clusters are to be found. The pine forest and shrublands surrounding the sulfur region are home to thistle, snowberries, and all common varieties of mountain flowers. Mora tapinella and to some extent nightshade can also be found throughout the hold. In the last parts of the White River, stretching from Mixwater Mill to the Sea of Ghosts, nordic barnacle is common. Two main routes run north to south in Eastmarch. They skirt the sulfur pools on either side. The roads are connected to each other at the far northern and southern ends, forming a continuous loop. 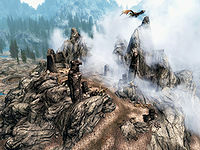 There are also major branches off of this road: one west of Fort Amol leading to Whiterun; one west-northwest of Cragslane Cavern leading south to the Rift, and two near Windhelm. One leads to the Pale and beyond, and the other along the Sea of Ghosts past farms until you hit the impassable, invisible wall near Refugees' Rest. There are two pathways into the sulfur pools from the east road: one runs from south of Kynesgrove to Witchmist Grove, and the other starts near Steamcrag Camp and heads west to Bonestrewn Crest. Other pathways in the hold are to landmarks such as the dragon mound above Kynesgrove (and, by extension, Narzulbur), or Mistwatch. All locations in Eastmarch with individual map markers are listed. There are a few places without map markers listed for your convenience. 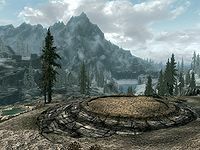 There are five Dragon Mounds in Eastmarch. There are a few Shrines in Eastmarch. A Shrine of Akatosh northwest of Cragslane Cavern. A Shrine of Dibella west of Abandoned Prison. In addition, many miscellaneous quests, such as favors, are located in Eastmarch. They are listed here. Eastmarch also appears in ESO. 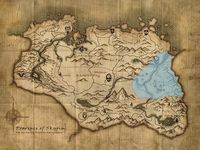 The "march" part of "Eastmarch" implies a borderland (as in "Marches": a frontier or border area between two countries or territories; from a Latin origin word meaning "margin"), and can be pronounced as "march" or "mark". This page was last modified on 17 December 2018, at 06:44.